Scott Edward Wallace Facey, son of Ivan and Joan (nee Boynton) Facey grew up at Lot 26, Concession 8 of East Nissouri Township. He is a member of the Regiment of the Canadian Electrical and Mechanical Engineers. He served with a United Nations task force in Bosnia for 6 months in 2000. 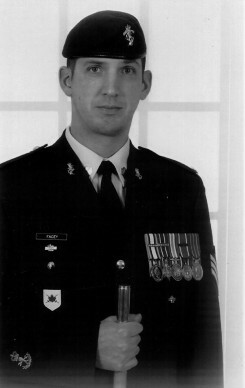 In 2002 he served with the NATO Alliance in Afghanistan. He was assigned to the 3rd Battalion of the Princess Patricia’s Canadian Light Infantry (PPCLI) out of Edmonton and then served his second tour to Afghanistan. Scott currently resides in Brandon, Manitoba with his wife Sherri and their two children: Kegan and Bryn.